These photos were taken during several walks on Friday, Saturday and Sunday, June 14 to 16. 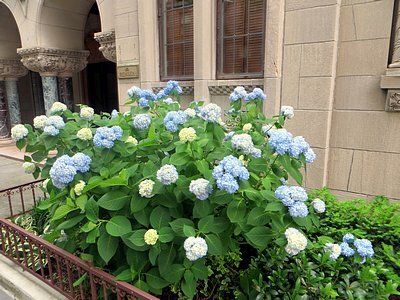 Hydrangeas were in bloom on Remsen Street just east of Hicks. 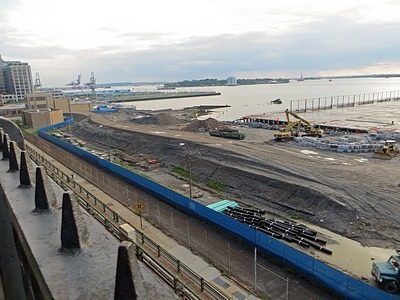 Basic work appears complete on the first of the sound attenuating berms meant to shield Brooklyn Bridge Park from the noise of the BQE. A view from the Promenade at sunset. 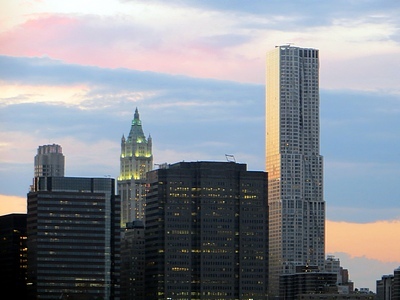 Frank Gehry’s 8 Spruce Street (a.k.a. New York by Gehry), presently the tallest residential building in the Western Hemisphere, is at right. In the background is Cass Gilbert’s masterpiece, the Woolworth Building, which is celebrating its 100th anniversary this year. 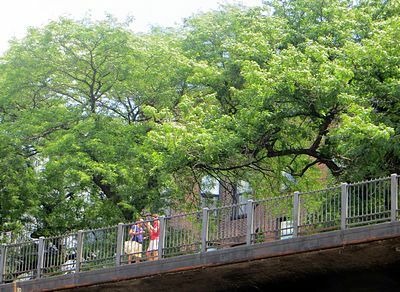 The Promenade from a new perspective. 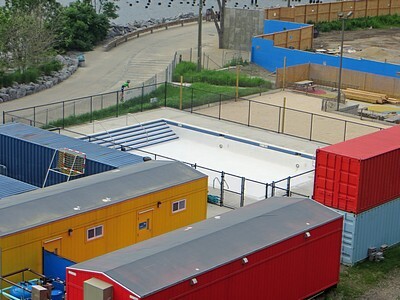 On Saturday, a crew was busy cleaning the pop-up pool in Brooklyn Bridge Park, getting it ready for a season preview party for Brooklyn Bridge Park Conservancy members only, on Wednesday of next week, June 26. 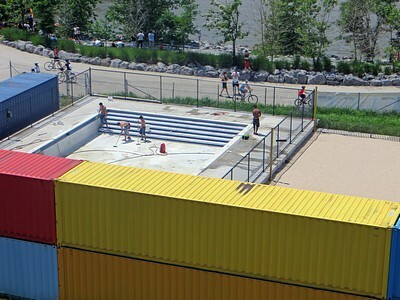 The pool will be open to the public some time soon after that. On Sunday, the pool looked very clean. 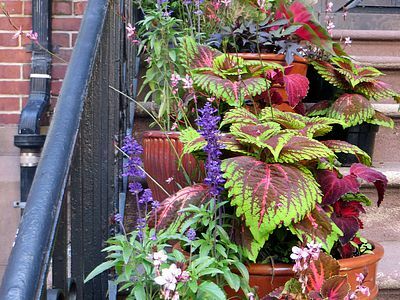 Potted plants on a stoop, Henry Street between Joralemon and Remsen. 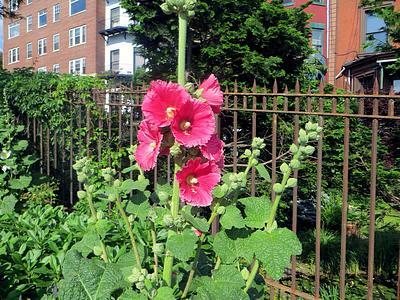 Hollyhocks, Remsen Street entrance to the Promenade. 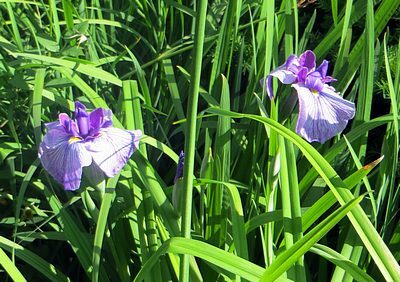 Irises, Montague Street entrance to the Promenade. 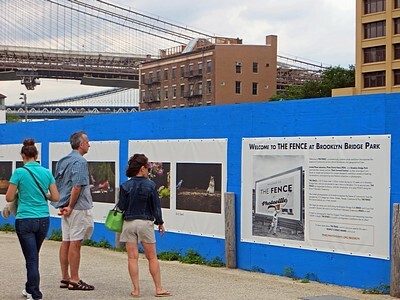 The new Photoville Fence was getting lots of eyeballs. Walking on Pier 1 in Brooklyn Bridge Park, I heard something overhead that didn’t sound like a helicopter. 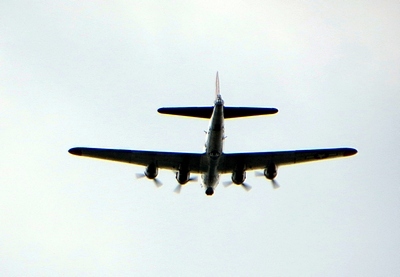 Looking up I saw a World War Two vintage B-17 Flying Fortress. The Flying Fort took a long turn around the lower tip of Manhattan before proceeding up the Hudson. 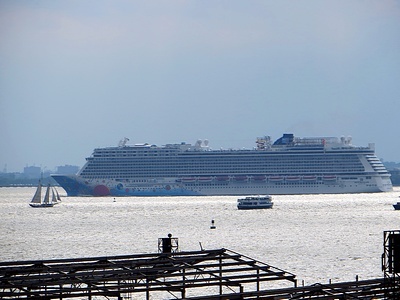 Seen from the Promenade on Sunday afternoon, Norwegian Breakaway, all 144,000 tons of her, heads out on a cruise to Bermuda. Great photos, Claude. If you’d looked through the fence behind the Hollyhocks, you’d have seen that charming little goldfish pond, invisible for decades because of the screening fence, recently removed. Thanks, Andrew. I’ll check that out on my next walk. 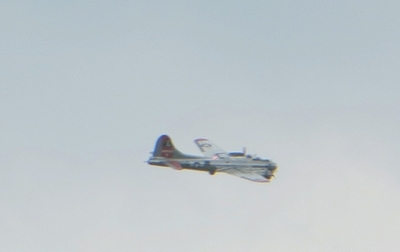 I wonder where that B-17 was headed?